meghan eats local: Are You There, Peanut Butter Toast? It's Me, Meghan. Are You There, Peanut Butter Toast? It's Me, Meghan. In a recent post, I explained that since I'm already Meatless in May (and in every other month), I'd get on the deprivation train by giving up the food I love most, peanut butter toast... but not until we got to a month that begins with the letter "P." For alliteration's sake. Well, my friend Linda pointed out that although there is no month that begins with "P," the French Republican Calendar, used by the French government from after the Revolution until 1805, included a month called Prairial. Thanks, Linda. So I pledged to give up peanut butter toast for the month of Prairial, thus committing to be "Peanut Butter Toast-less in Prairial." A bit clumsier than Meatless in May, perhaps, but I like clumsy things. I used to celebrate Lent (I used to do a lot of crazy things), so I figured it wouldn't be too hard to give up something I love to eat for one month. Prairial begins on May 21st and lasts until June 19th, meaning the peanut butter toast fast is going to begin in just ten days. I have been consuming as much peanut butter as possible so I won't have a big jar full of peanut butter whispering, "Put me on toast and eat me!" from my cabinet during Prairial. But as it turns out, I might not have to give up peanut butter toast for Prairial after all. 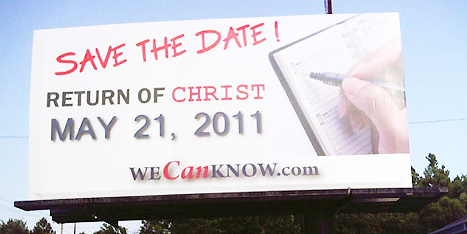 That's because Family Radio in Oakland, California has predicted the world will end on May 21st, 2011. Apparently, the Bible says so. The Family Radio website has a countdown ticker and everything. So that means in ten days, nobody will be eating peanut butter toast (or anything else, for that matter). I think one of their writers, Harold Camping, really nailed it when he identified gay pride as a "sign of the end" planned by God, and from there, all the puzzle pieces just fall into place, leaving no room for doubt. I could go on forever about the wonders of Family Radio's website, but if they're right, then I can only go on for ten days. And I'm not about to waste my last ten days complaining about Family Radio. If you are wondering what it might feel like to have your head explode, visit the website they advertise at the bottom of the billboard. Now that I know the world is going to end in ten days, I have to ask myself, am I going to keep being a veghan? Yahweh. 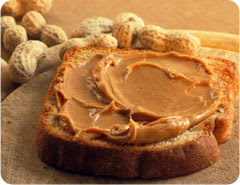 My plan was to binge on peanut butter toast until May 21st, and I'm sticking to it. Besides, let's say that God/Jesus/Buddha/Peanut Butter Toast/Sacred Cows really do decide to hold judgment day on May 21st. Frankly, not eating animal products is pretty much the only thing I have going for me. I just hope the sacred cows get the last word.